Early accounts of the Loch Ness Monster's lesser-known cousin have been uncovered by researchers. Morag is a mysterious creature said to inhabit the depths of Loch Morar, in the Lochaber area of the Highlands. His scripts have been uncovered by the Carmichael Watson project at the University of Edinburgh library. The writings, thought to date from 1902, paint a conflicting view of Morag. On the one hand, she is presented as a mermaid-like character with flowing hair, while another description paints her as a grim reaper whose sighting was viewed as a death omen. Dr Donald Stewart, a senior researcher on the project, discovered the texts while leafing through a "mad mixture" of folklore collected by Carmichael over 50 years. "We were so pleased when we found them, it was just totally unexpected," he said. In the first text, Carmichael states: "Morag is always seen before a death and before a drowning." A second text reads: "There is a creature in Loch Morar and she is called Morag. She is never seen save when one of the hereditary people of the place dies. "The last time she was seen was when Aeneas Macdonnell died in 1898. "The Morag is peculiar to Loch Morar. She is seen in broad daylight and by many persons, including church persons. "She appears in a black heap or ball slowing and deliberately rising in the water and moving along like a boat water-logged. "The Morag is much disliked and is called by many uncomplimentary terms." A final description, penned by Carmichael at a later date, retains Morag's association with death but sees her take on more human characteristics. He wrote: "Like the other water deities, she is half-human, half-fish. The lower portions of her body is in the form of a grilse and the upper in the form of a small woman of highly developed breasts with long flowing yellow hair falling down her snow white back and breast. "She is represented as being fair, beautiful and very timid and never seen save when one of the Morar family dies or when the clan falls in battle. "Then she is seen rushing about with great speed and is heard wailing in great distress, bemoaning and weeping the loss of the House of Morar laid desolate. "The Morag has often brought out of their houses at night the people living along the shores of the lake and in the neighbourhood of her haunts, causing much anxiety to the men and much sore weeping to the women." Carmichael, who became a figurehead for the celtic artistic movement, originally wrote the texts in Gaelic. He is thought to have spent only a couple of days in the area of Morar and did not claim to see Morag for himself. His main source of information about the monster appears to be a local named Ewan MacDougall. The first text was unearthed by Dr Stewart in 2011 and he later happened upon the other two. Speaking about the findings for the first time, he said: "Clearly, there's something going on in Loch Morar, whatever it is. "People make sense of it in different ways, depending on who sees it, what they're feeling at the time and how the story comes down from tradition afterwards. "I think the texts are pretty exciting. They give us a window back to how people saw this monster well over 100 years ago. They're the first reported sightings that we have. "It shows that there were other monsters vying for popularity and Nessie happened to win out in the end. But there were a lot more of them out there." More recent sightings have depicted Morag - whose home is only about 70 miles from Loch Ness - as a humped serpent-like creature similar to the more famous Nessie. The first recorded sighting of Morag was in 1887, while in 1948 nine people in a boat claimed to have seen a 20ft-long creature in the loch. In 1969, two men claimed to have accidentally hit the creature in their boat. Morag is said to have disappeared after one of the men hit it with an oar while his companion opened fire with a rifle. 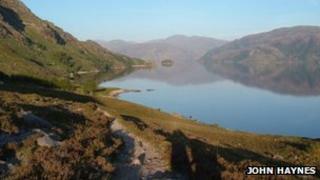 Loch Morar is the deepest freshwater body in the British Isles, with a maximum depth of 310m (1,017ft).